Death 1913 Eileen Mary Wales died in 1913 at Cootamundra, NSW, AustraliaG. Birth 1913 She was born in 1913 at Cootamundra, NSWG. Birth James Fisher was born at EnglandG. He was the son of Thomas S Fisher and Margaret Unknown. Marriage James was married to Harriet Seviour, daughter of John R Seviour and Ann Unknown. Birth Harriet Seviour was born at EnglandG. She was the daughter of John R Seviour and Ann Unknown. Marriage Harriet was married to James Fisher, son of Thomas S Fisher and Margaret Unknown. [S440] Elaine Hodda, "James Wales' Descendants," e-mail to Robert Mote, February 2004. Birth 1856 Thomas W Willman was born in 1856 at Sydney, NSW, AustraliaG. He was the son of William C Willman and Amelia Unknown. Marriage 1887 Thomas W was married to Emily H Maclean in 1887 at Bathurst, NSW, AustraliaG. Death 1934 Thomas W Willman died in 1934 at Bathurst, NSWG. Birth Emily H Maclean was born. Marriage 1887 Emily H was married to Thomas W Willman, son of William C Willman and Amelia Unknown, in 1887 at Bathurst, NSW, AustraliaG. Married Name 1887 As of 1887, her married name was Emily H Willman. Marriage William C Willman was married to Amelia Unknown. Marriage Amelia Unknown was married to William C Willman. Married Name Her married name was Willman. Birth 1887 Thomas C W Willman was born in 1887 at Paddington, NSW, AustraliaG. He was the son of Thomas W Willman and Emily H Maclean. Marriage Thomas C W was married to Mabel A Unknown. Birth 1893 Archibald H M Willman was born in 1893 at Bathurst, NSW, AustraliaG. Birth 1898 Harriette R M Willman was born in 1898 at Bathurst, NSW, AustraliaG. She was the daughter of Thomas W Willman and Emily H Maclean. 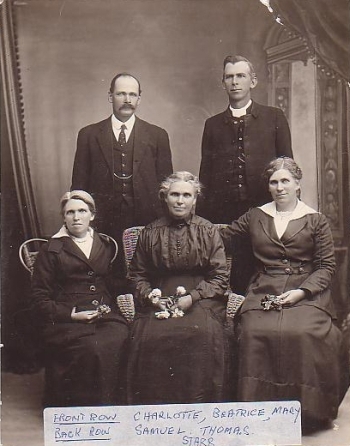 Marriage Mabel A was married to Thomas C W Willman, son of Thomas W Willman and Emily H Maclean. Lily Wales was the daughter of Harold Ambrose Wales and Louisa E Ferguson. Death 1931 Lily Wales died in 1931 at Rockdale, NSW, AustraliaG. Harold S Wales was the son of Harold Ambrose Wales and Louisa E Ferguson. Death 1933 Harold S Wales died in 1933 at Kogarah, NSW, AustraliaG. Birth John C Ferguson was born. Marriage John C was married to Catherine J Ferguson. Birth Catherine J Ferguson was born. Marriage Catherine J was married to John C Ferguson. Marriage James G was married to Susan J Unknown. Marriage Susan J was married to James G Wilson. Married Name Her married name was Susan J Wilson. She was the daughter of Samuel Starr and Eliza Southwell.